As previously mentioned, the ladies who did the Gibson Girl dresses last year are doing 1830s for the April Gaskell Ball. I made a Pinterest board with ideas for gowns and hair. 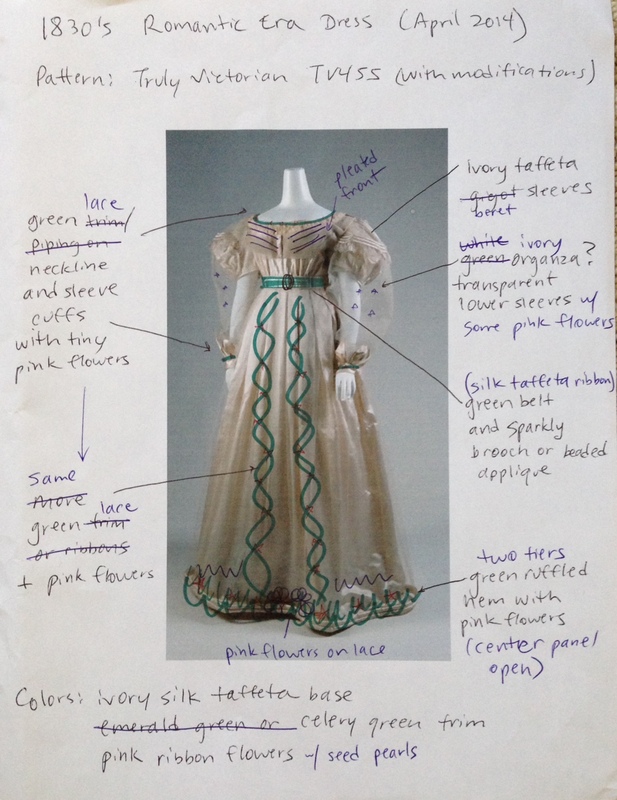 Here is my planning sketch, based on an extant gown with sheer sleeves. Unfortunately, I do not know the source because the image was found uncredited from Tumblr. 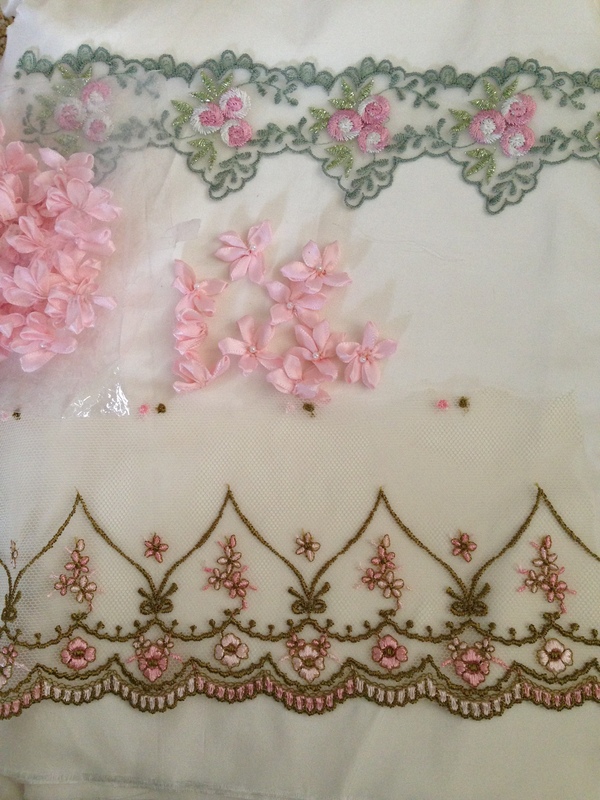 My materials will be ivory silk taffeta (left over from my wedding dress), embroidered laces from Etsy and eBay, and pink ribbon flowers left over from a Gatsby dress project. I am hoping to piece together enough fabric from my stash for the lining. 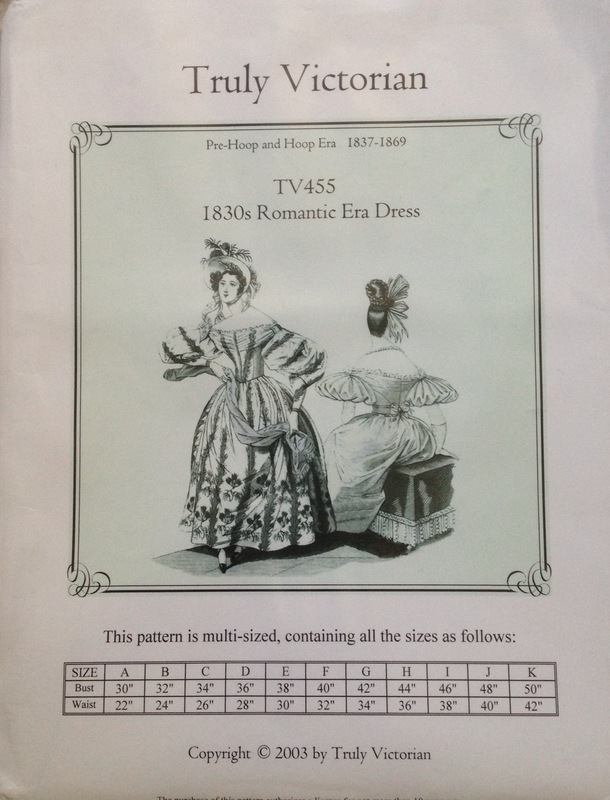 I am using the Truly Victorian 455 pattern for the bodice, with a slightly different sleeve. I will be using the beret sleeve pattern, but might make it slightly smaller since it will be under a sheer sleeve. I am not using the TV455 pattern for the skirt, because I am upcycling part of my wedding dress. I am doing this for several reasons. 1. It will match the leftover fabric I am using to make the bodice. 2. I haven’t worn the dress for several years, and never got around to dyeing it a different color, so at least this way part of it will appear in public again. 3. The dress was custom-made for me by a friend of mine (who sells Regency/Victorian/Steampunk menswear in her shop), and is very special, so I don’t want to give away or sell the gown. However, I can’t wear the dress as-is because during my honeymoon a family member decided to soak my dress in the bathtub instead of taking it to the drycleaner like I wanted, and the silk taffeta literally shriveled up. I spent a lot of time steaming most of the wrinkles out, but could not save the ruffles. They are now sad, wrinkled and limp, instead of crisp and happy, and don’t look right on a formal ballgown. 4. It’s a shame to let so much silk go to waste! I have cut out the pattern pieces, and am now slowly picking out the stitches to remove the rows of ruffles from the skirt. (Thankfully, the beautiful bodice is still in good shape and can be worn again). Photo by Lydia Chen Photography. Hi Gina, thank you for your comments. Your project for your granddaughter sounds delightful! I think for a small sleeve for a girl a flat-lined fabric will work just fine. (Also, if it’s a little flat anyway you can stuff something inside. At a ball one of my friends had to stuff in some toilet seat covers!) When I say it’s almost a circle I mean it’s not perfectly round. It’s a little wider at the top. Imagine a soup spoon or old-fashioned baby bonnet. Please let me know if you have any other questions!